Often, female characters can be career focused at the expense of their personal lives. Think of Shirley Schmidt of Boston Legal or Megan Hunt of Body of Proof. Even Liz Lemon of 30 Rock, who may appear on this series later, spends all her time at work. Others, like Pam Beasley of The Office or Lily Aldrin of How I Met Your Mother, give up their dream jobs for more practical careers and then their story lines turn to pregnancy and motherhood in later seasons, as if writers don't know what else to do with them. Leslie Knope is a strong female character because she's as career driven as Shirley Schmidt, but she has friendships as strong as Lily Aldrin. Leslie is the Deputy Director of the Parks Department in Pawnee, Indiana. She is a dedicated public servant who dreams of one day being elected President of the United States. 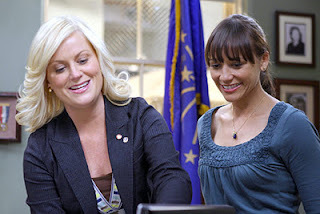 When Parks and Rec first premiered, it seemed to be The Office transposed into small-town government. Leslie Knope was going to be a female Michael Scott, bumbling toward her unrealistic goals. The first season focuses on Leslie trying to fill in a pit behind her new friend Ann's house in order to turn it into a park. 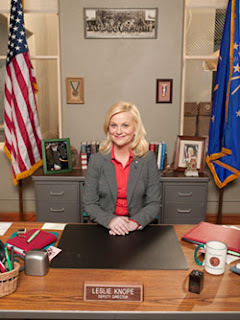 Leslie's determination is clear in these first six episodes, but the second and third seasons develop her character more fully, as she continues to work to build a park - or at least fill in the pit - and runs into problems when the Pawnee government goes bankrupt and shuts down. Unlike Michael Scott (or at least early Michael Scott) Leslie is excellent at her job. When Leslie has to miss work in the episode "Christmas Scandal," the rest of the Parks Department must fill in for her. They must divide up her daily tasks, since no one person can take over everything that she does, and her boss Ron Swanson is relieved when she returns to work. Her success with the Harvest Festival in season three further demonstrates her talents. Though she is most often friendly and optimistic, Leslie gets frustrated by setbacks and can occasionally lash out at people who oppose her. Leslie does not easily separate her personal passions from her career, but she is usually in control of herself enough and cares enough about those around her to fix the mistakes she makes. Her focus on her job does not keep Leslie from having a personal life. Leslie is as dedicated to her friends as she is to the people of Pawnee. Many episodes explore her friendship with Ann, who is a nurse at the local hospital. One of my favorite moments is when Leslie drunkenly declares that they are "best friends of ever!" Leslie is equally enthusiastic about her other friends and coworkers. Several times, Leslie pulls Ron Swanson away from his terrifying ex-wives Tammy 1 and Tammy 2; she takes Tom out to help him after his divorce; she even stands up for Jerry (briefly) when he gets mugged in one of the parks. The third season's "Eagleton" episode demonstrates Leslie's commitment both to her job and her friends. When the neighboring town of Eagleton builds a fence to keep Pawnee kids out of their half of a shared park, Leslie attends an Eagleton town meeting to demand that the fence be taken down. She must confront her former best friend and current rival Lindsay Carlisle Shay, who used to work in Pawnee before becoming the Director of Parks and Recreation in Eagleton. When Leslie's speech at the town meeting gets her nowhere, she angrily decides to throw trash over the fence onto the Eagleton side. After a fight with Lindsay and a night in jail, Leslie finds a more constructive angle to deal with the fence. She transforms it into the back wall of a field for the new Pawnee wiffle ball league. Despite initial failure (and jail time), Leslie turns the fence into something that Pawnee can enjoy. The episode also illustrates Leslie's style in personal relationships. 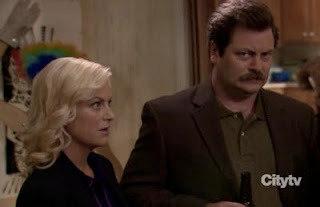 Though Ron has kept his birthday a secret for years, Leslie finally figures out which day it is and tells him that she is throwing him a surprise party. Ron hates surprise parties and starts asking around about what Leslie has done for other people's birthdays. Ann tells him about how Leslie surprised her with a huge party, balloons, and a dinner out with a mariachi band. Ron overhears his assistant April organizing parking around his house and party-related deliveries. He grows more and more anxious as his birthday grows closer, hoping to thwart Leslie's thoughtful plans. When Leslie finally arrives to show him his surprise, Ron is shocked when she leads him to a quiet room guarded by security where he can enjoy a steak dinner, a bottle of whiskey, and two classic films without being disturbed. When he asks about Ann's birthday, she responds, "Why would I throw Ron Swanson an Ann Perkins party?" Leslie cares and learns about her friends and coworkers to the point that she can throw Ron the perfect birthday surprise, but she's also comfortable enough to mess with him a little beforehand. "Leslie has a lot of qualities I find horrifying, but the worst one by far is how thoughtful she can be." Leslie Knope is a strong female character because she is goal-oriented and well-rounded. She's not the driven career woman who has no time for friends or dating and she's not the romantic girl who has a mediocre job but falls in love weekly. She anchors the show by balancing her career, her friendships, and romantic relationships. She doesn't let failures stop her entirely, but rather approaches each challenge energetically. Leslie Knope is a woman who may not have everything figured out, but at least she's trying. She hasn't given up, and I doubt she will. What do you think of Leslie Knope? Just for fun, here's Amy Poehler's Harvard Class Day speech.